Try outs open! 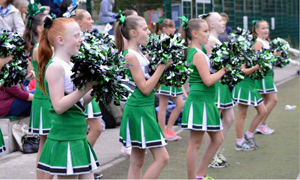 The ISL Spirit Squad is a fun way to show school spirit and gain self-confidence. The Squad is open to all ISL students, girls & boys from grades 6-12. No previous cheer experience is needed, just a commitment and desire to learn. We incorporate dance & gymnastics in our routines and cheer during ISL’s soccer and basketball games during the sport’s season. We train twice per week on Mondays & Thursdays from 15:45-18:00 in the Courtyard Gym. You MUST wear comfortable training attire/shoes, elastic for your hair, a snack and water! All serious participants are welcome!